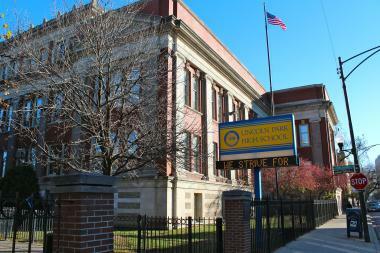 Lincoln Park High School, 2001 N. Orchard St., will begin operating as a wall-to-wall International Baccalaureate program next fall. LINCOLN PARK — Lincoln Park High School's transition to a wall-to-wall International Baccalaureate program has some parents confused about what this means for the existing IB effort. Intended to improve the quality of the school when it begins in the fall of 2013, the wall-to-wall IB program means that all freshmen and sophomores will be enrolled in the rigorous academic schedule, but broken up into groups based on test scores. Students will have the option of taking IB classes during their junior and senior years. Currently, about 20 percent of Lincoln Park students are enrolled in the IB program, which begins with a Middle Years Programme that encourages students to make a link between their traditional studies and the real world during their freshman and sophomore years. This is followed by an intensive Diploma Programme for their junior and senior years. Under the wall-to-wall approach, some students who excel during their freshmen and sophomore years may be considered for the Diploma Programme. It is not clear how many students will be admitted. The majority of students in the Diploma Programme still will be those who applied for it in eighth grade. The Diploma Programme involves the of study of six subject groups, two languages and an extended in-depth essay of up to 4,000 words. Students are required to join a club or sport and take final assessments similar to Advanced Placement tests. "My concern is that they are going to change the integrity of the program. This is one of the longest-established IB programs and recognized program in the country," said Francine Konieczko, a Noble Square resident whose son is in eighth grade. Konieczko is worried that the intense curriculum standards for the IB Diploma Programme would be watered down with the wall-to-wall approach. Lincoln Park High School's principal, Michael Boraz, disagreed. The curriculum, which is used by some 2,000 schools worldwide, has been shown to help students of all skill levels excel, he said. Konieczko's son applied to Lincoln Park, 2100 N. Orchard St., as his first choice because of its fine arts program which would allow him, if he is accepted, to continue to play the saxophone while enrolled in an academically challenging IB curriculum. "I think it's going to confuse a lot of parents saying you have this IB program and this wall-to-wall program," Konieczko said. "We aren't going to know until two years down the road what our options are and where students are going to fit." But Boraz said students who have been accepted into the school's IB program as freshmen will not see a change. Boraz hopes the transition to a wall-to-wall IB program will give more students a taste of the IB curriculum during their first two years and lead them to enroll in the school's IB Diploma Programme for their last two years of high school. Compared to other city public school high schoolers, CPS students who have completed the IB Diploma Programme were 40 percent more likely to attend a four-year college and 50 percent more likely to attend a more selective college, according to a University of Chicago Consortium on Chicago School Research study. The IB success may persuade Lincoln Park parents to stay in the neighborhood and send their students to their neighborhood school, Boraz said. "People who live in this neighborhood have more options," the principal said, who estimated that 40 percent to 60 percent of high school-age students in the Lincoln Park boundaries attend private or selective-enrollment schools. Once the wall-to-wall program is in place, Lincoln Park High School will continue to operate as a neighborhood school and will enroll any interested students from the attendance area. The visual and performing arts programs, including music and drama, will remain a centerpiece of the school. The school began offering the IB program to a limited number of applicants around 1980, and about 120 to 150 spots are offered for the IB pre-diploma magnet program each year. Approximately 2,340 students are enrolled at the school. During a news conference announcing the wall-to-wall program at Lincoln Park High School and Taft High School, Mayor Rahm Emanuel said the IB program expansion turns these schools into competitive choices among selective enrollments. "This is something that's fairly close to magic," Boraz said of the results an IB curriculum can have on students. Konieczko said she and others worried about the change are "just going to hold our breath and wait and hope the program is still there — [that] it's not changed or reformatted in some way and will still be there for our students."